Thanks for a great October event! Thank you to all who made it out to the October Eco-challenge potluck and Earth-plastering skill-share! This was the first event held in several months and it was wonderful to see so much interest in building the Reskilling community. Guests at the potluck learned about Reskilling’s origins from the Transition Movement and how Ann Arbor – Ypsi Reskilling promotes resilience and builds community. Basic earth-plastering using clay and straw was taught by Jacob Gnath, an intern of Deanne Bednar at the Strawbale Studio in Oxford, MI. He showed how to sift clay, what the correct ratios of sand-clay are for plastering, and how to apply the plaster over an existing surface. Guests had a great time getting their hands dirty by helping transform a community space! We look forward to seeing everyone on December 8th at our next event! Come learn sustainable living skills! strawbalestudio.org 248-236-5432 Located outside Oxford, MI ~1 hr N of Detroit. 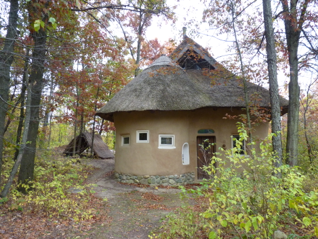 Enchanting thatched & living roofs, strawbale cottage, Hobbit Sauna, Earth Oven, Rocket Stoves + Group Discounts & some scholarships available. Hands-on Classes below! Details at website. Come for a few weeks, or more. Live and work on site, participating in NATURAL BUILDING, sustainable activities & workshops during your stay. December 9 & December 10, 2017 – same class offered 2x! CANDLE-MAKING & Holiday Gift Class Enjoy the season by making dipped beeswax candles + other natural gifts. $30 early bird special*/$40 thereafter. Limit of 12. Register soon. Ypsilanti Everything Is Free Faire joined us at our October event to share what they have been working on and how it pairs well with Reskilling! Learn more about their human-directory project and their ambition to connect community members to share skills and services.